The most important characteristic of an industrial scale is its technical specifications, including its capacity, its accuracy and its resolution. The second most important characteristic is the user interface. This is what allows the scale users to indicate the information they are looking for, and to have that information presented to them. There are a wide variety of industrial scales available for different applications. These include floor scales, platform scales, bench scales, parts counting scales, cylinder scales crane scales, and many others. Most of them are based on the same technology, that is, strain gage load cells. Therefore, the technical specifications are going to be quite similar among the high quality brands, such as Arlyn Scales, among others. There may be some important differences, such as the material from which the load sensor is manufactured. Arlyn Scales uses stainless steel, so the scales tend to be much more rugged. There may be some differences in the size and height of the scale platform, with some scales being more convenient to use than others. But overall, the performance will be within the same range. But there can be wide differences in the user interface. The simplest, lowest functioning scales typically have a numeric display and a few buttons for a front panel. The display may also include a few indications as to the unit that is being shown, such as pounds or kilograms. The numeric display will generally either be liquid crystal (LCD) or light emitting diodes (LED). LCD is often preferred as it uses less power, and may be easily viewed in bright light conditions. LED is very useful in less well lit conditions, as it produces its own light. As a step up in capability, some LCD displays may provide a backlight, so that it can be easily viewed with poorer lighting. But of course that will increase the power consumption, which may only be of concern with battery powered industrial scales. Better LCD units may also include a number of special indicators that can communicate some other information to the user. Besides the unit of measurements, there may also be indicators that the weight on the platform has reached a stable value. There may be multiple numeric displays that can show the value of a tare weight, or the piece weight of a component for a parts counting scale. Other useful indications may also be noted. These will all be valuable pieces of information, but will still be limited in function. An important step up would be an LCD display that has graphics capability. Generally, this would consist of a panel that includes a large number of pixels, each of which may be controlled independently. This provides the scale manufacturer with the opportunity to convey significantly more information. A typical graphics panel may have a grid of 128 pixels across by 64 pixels down. The panel must also be large enough to be easily read in industrial conditions. It is now easy to provide menus to the scale operator. This can be used to help prompt the operator, and to only show the information that is required for the function that the operator is currently using. The most effective user interface is a color, touch screen. This level is only found in the highest quality scales, such as Arlyn Scales. Now the front panel buttons may actually be placed on the graphics screen. Only the choices that are necessary for the specific actions need to be shown at that time. This makes the scale much easier to use, as the operator does not have to remember various button sequences. Color may be used to more easily convey important information to the operator. For example, and alarm condition can be shown in red. It is much easier to retrieve large amounts of data for review. As with a personal computer, the screen may have drop down menus, and slider bars to quickly scroll through lines of data. It will now also be much easier to enter data, such as parts identifications names or codes. This is important when the scales may be connected into a computer system for data collection and further analysis. 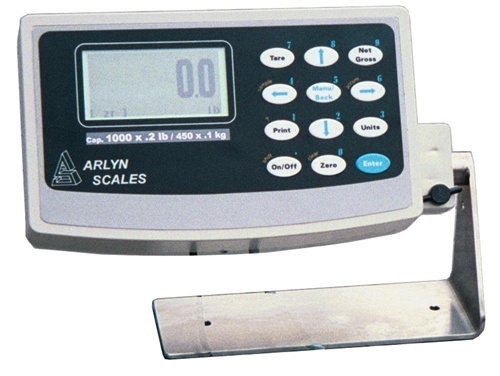 As with the case of the Arlyn Scales, this type of scale will generally be provided with a variety of means of communicating with a computer system, such as with a Universal Serial Bus (USB), or even better, an Ethernet interface.